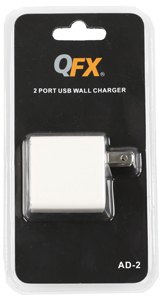 QFX's 2 Port AD-2 USB Wall Charger creates a reliable power source for your phone, tablet, and other devices. Both 2.1A ports allow you to charge two devices, such as your tablet and Phone, simultaneously. 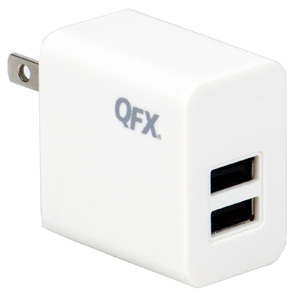 This wall charger plugs directly into a wall or power strip. Because it uses a separate cable (not included), this charger is also suitable for use with non-Apple USB devices, such as the Amazon Kindle Fire, Samsung Galaxy SIII, or any other device that uses standard USB power levels, by using the appropriate charging cable.